The Library is open to students at the time indicated on their respective Class Time-Tables. Absence from the library at this time is punishable. Only two books are issued on a card. Books are issued strictly in order of application. It is left to the discretion of the Librarian not to issue certain books when circumstances warrant it. The period of loan of books is seven days, which may be extended to a maximum fourteen days, provided the book is not required by another reader. A book may be issued for less than seven days if there is a heavy demand for it. Books are issued for the exclusive use of the borrower. 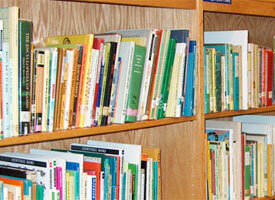 Anyone found lending library books to another may be denied the facility of the Library. Students must, on receiving a book, examine it, and report any damage found therein. If they fail to do so, they will be held responsible for any damage that is detected later. Books lost, must be paid for at the current cost of the book. If the last title is not available, the cost charged will be doubled. In case of very old books the cost will be decided by the Management. Strict action will be taken against students who damage books in any way. A fine of 10 per book, per day including Sundays and holidays will be levied on books retained without renewal beyond the due date. Students who repeatedly fail to return books in time may be denied the use of the Library altogether. A fine of 100 will be charged for the loss of the library card. Reference books and periodicals cannot be borrowed, or taken out of the Library. However, the librarian may, at her discretion, loan books from the Reference Section for a limited period of time. A fine of 10 per day will be charged after the due date. All books must be returned before the commencement of each Terminal Examination, and before a Transfer Certificate is issued. No personal belongings to be brought to the Library without permission.